A backyard garden can become a haven for native bees. It can provide a long-lasting and varied source of the nectar, pollen and building materials that bees need. A well-planned garden can be even better for the bees than natural bushland, where the trees and shrubs may all flower at once and little may be available at other times of the year. Here are some tips to help you plan your Bee-Friendly Garden. 1. Select plants that flower right through the year. Many native bees need nectar and pollen throughout the year. Although many of the solitary species, such as Blue Banded Bees and Resin Bees, only fly in the warm months, others, such as Stingless Bees, Reed Bees and Carpenter Bees, fly on warm days all year round. So choose plants with a long flowering period, or choose a selection of plants that will flower in sequence in each season of the year. 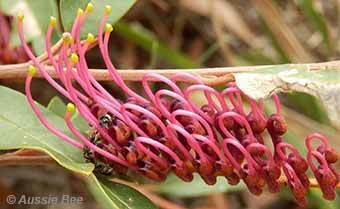 Grevillea 'Poorinda Royal Mantle' is a low spreading shrub that provides copious nectar to bees for most of the year. 2. Select flowers with a variety of colours and shapes. Different kinds of native bees like different kinds of flowers. -- Some have short tongues and like shallow flowers such as daisies, tea tree (Leptospermum) and Eucalypt blossom. Others have long tongues and like tubular flowers such as Coastal native rosemary (Westringia), lavender and salvia. -- Some prefer blue or purple flowers. However, mauve, pink, yellow and white flowers are also popular. -- Some native bees have strong preferences for a particular native flower. 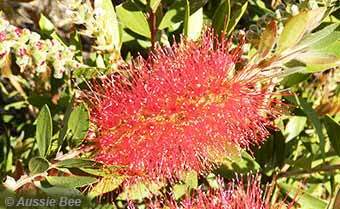 However many will happily visit a wide range of both exotic and native flowers. 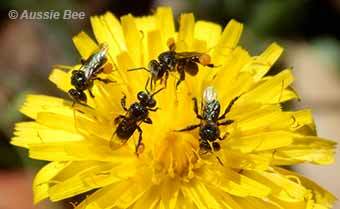 Native bees enjoy exotic flowers as well as native flowers. Indeed, even weed flowers can help support native bees! Dandelions are tough, drought-tolerant and long flowering. Stingless Bees and Lasioglossum Bees love them. So it is a good idea to consider the seasonal conditions and the availablilty of other flower resources thoughtfully, when you weed your Bee-Friendly Garden. 3. Plant a group of each flower species. If you can plant a bed or row of a particular flower, this will attract native bees more easily than scattered plants. However, even a small Bee-Friendly Garden will help the bees, as they will visit your garden along with those of your neighbours. 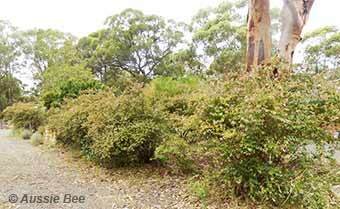 This row of Abelia shrubs provides substantial, long-lasting nectar and pollen resources during summer at the Australian Native Bee Research Centre. 4. Select plants that provide nesting materials for the bees too. In addition to nectar and pollen, some bees need collect materials to build their nests. 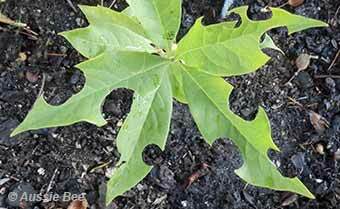 Leafcutter Bees cut small circular or oval-shaped pieces of soft leaf to construct nest cells for their young. They particularly like the leaves of rose bushes, Buddleja, Bauhinia, Desmodium and wisteria. Resin bees need to collect resin from trees to construct their nests. We sometimes collect some resin from our Stingless Bee hives and put this out for the Resin Bees to use. The soft leaves of this Salvia provided ideal nesting material for some local Leafcutter Bees. Salvia flowers are also popular with a wide range of bees. 5. Avoid insecticides in your Bee-Friendly Garden. Insecticides will kill native bees as well as garden pests. Try to avoid using any insecticides in your garden. However, if you really have to use one, choose an insecticide that has low toxicity for bees, try to apply it when bees are not active (such as at night or on a cold day) and avoid spraying the flowers of the plant. 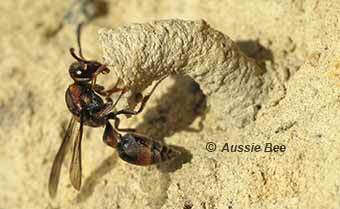 Natural predators such as this solitary wasp can help a gardener avoid using insecticides. Wasps like these catch caterpillars and other garden pests to feed to their young, and they often nest in Bee Hotels along with the native bees. Other natural garden predators include ladybirds, flies, lacewings and preying mantis. For suggestions on which plants to use in your Bee-Friendly Garden, take a look at Aussie Bee's list of Ten Favourite Flowers Loved by Australian Native Bees. Discover why native bees are so important for pollination. And now that you have a Bee-Friendly Garden, why not set up some Bee Hotels to provide nesting sites for your local solitary bees. Read Aussie Bee's Guide to Setting Up a Bee Hotel.